To eat in a restaurant was an extraordinary and memorable event when I was growing up in the nineteen-forties. With my parents trying to get on their feet financially after my father’s illness, every penny of every spending decision was thoroughly weighed and gravely pondered. Eating out didn’t enter the equation. However, every July during my father’s vacation when the mill shut down for two weeks, the rules might be relaxed, just a little. On our way home from one of our day trips, a cruise down the Delaware River on the Wilson Line to Riverview Beach Park, we stopped on the sidewalk between Second and Third on Market Street. In the orange light of a summer sunset, my younger brother and I watched as our parents became engaged in earnest discussion, sorting out the serious issues regarding the expenditure of the price of a restaurant meal for the four of us. My father’s argument for the celebratory moment finally prevailed over my mother’s worried doubts about any spending that wasn’t absolutely necessary. 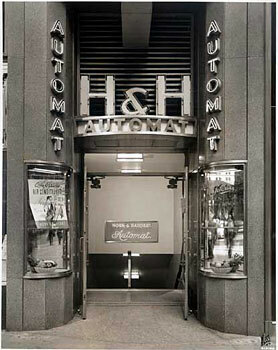 My brother and I were directed through a set of big metal and glass revolving doors into the chilly air-conditioned splendor of a Horn and Hardart Automat/Cafeteria restaurant. Even now, after years of sophisticated and not-so-sophisticated eating out, I always get some a rush of excitement upon entering a restaurant. The idea of sitting down and ordering anything you want from a menu remains one my life’s joyous little luxuries, one I associate with those and happy occasions like our post Riverview Beach dinner at Horn and Hardart’s.